With: Nicholas Ballas, Nicole Gramlich, Jonathan Harrell, Marcos Kelly, Roger Montoya, Bernadette Peña and Cristina Vigil. PERFORMANCES: September 4, 5, 6*, 11, 12, & 13, 2014 at 7pm; 7 & 14 at 5pm. *September 6 is the Gala performance and reception with special guests Mayor Javier Gonzales and playwright Irma Mayorga. Please support our efforts to build community through art and dialogue by purchasing a Gala Ticket ($100, of which $75 is tax deductible). 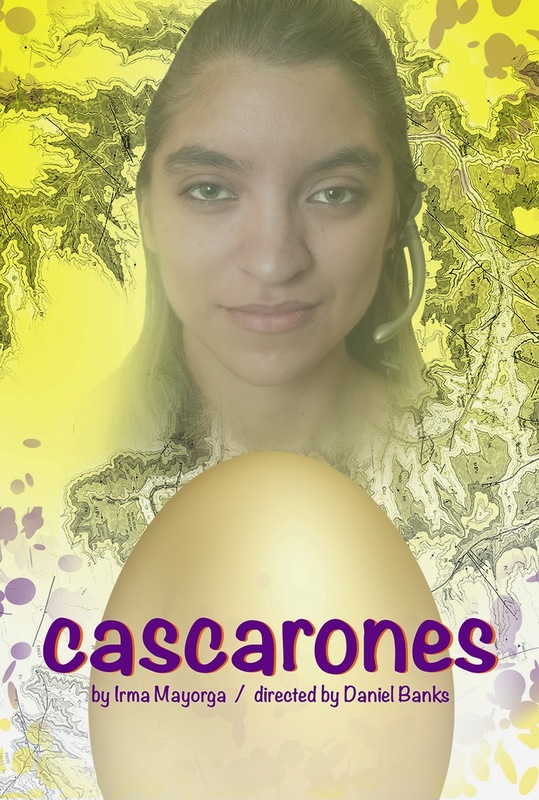 Cascarones takes place in San Antonio, Texas, as teenager Mary Margaret Caceres, who works for the transit authority giving people bus route directions, attempts to understand the mapping of her community and city. As she navigates the daily challenges her working class family faces, she encounters in a dreamlike state John Wesley Powell, Francisco Vásquez de Coronado, and the other men whose actions in the past influence her present. Please click here to view a special message from DNAWORKS Co-Director and production Director Daniel Banks on the importance of producing Cascarones. And here to hear award-winning playwright Irma Mayorga discuss why she wrote Cascarones. Tremendous thanks to Santa Fe Art Institute for hosting playwright Irma Mayorga as an Artist-in-Residence as part of their Community Partnership Initiative! This production would also not be possible without the support of the City of Santa Fe Arts Commission, the McCune Visual Performing Arts grant through the NM Community Foundation, over 120 individual donors, and additional in-kind donations from: CG Higgins Chocolates; Casa Chimayo; Chocolate Maven; Clafoutis; Gruet Vineyards; Revolution Bakery; Whole Foods; Swiss Bakery; Cowgirl BBQ; Ken Dettelbach/Gateway Marketing; Graphic Sky; Santa Fe Valet and Limousine; Seth Friedman/Back, Body, and Soul; Ehrland Truitt Acupuncture; Raymond Kurshals/Pilates Santa Fe; Chef Louis Moskow/315 Restaurant and Wine Bar; Paulo Tavares/Paulo T Photography; & Jeff Thompson/Movement Matters Massage. SUPPORT AN ARTIST! We still need your help! Please click here to make a tax-deductible donation. All further donations will go toward artist fees. We look forward to seeing you at the world premiere of Cascarones! DNAWORKS is dedicated to futhering artistic expression and dialogue, focusing on issues of identity, culture, class, and heritage. We catalyze performance and action through the arts in the intersecting communities in which we live and work. In our work, art = ritual = healing = community. We believe that this philosophy and practice lead to a more peaceful world.